Thank you, and good afternoon, ladies and gentlemen. I thank the World Media Association for this invitation. I am delighted to have a chance to talk to you. Our topic is the consequences of 9/11, specifically the cultural and religious dimensions. One could look either at the consequences in the Muslim world or in the West. I will talk about the former, the area of my expertise. The consequences are twofold. Short term, they are disastrous for the Muslim world. Long term, they are positive. In the next few minutes, I would like to cover three topics: first, my presumptions and how I read the situation; second, look at the short term; and third, look at the long term. My presumptions have to do with an understanding of Islam as a civilization. 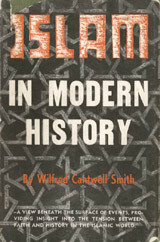 I was deeply influenced by a book that came out in 1958, Islam and Modern History, by the late Wilfred C. Smith. A student primarily of Islam on the subcontinent, he gave an overview looking at the subcontinent, Egypt, and Turkey. The basic thesis in this book is that Islam was a religion associated with success, but one that in the modern era has not had much success. He saw this as its outstanding challenge. To be more precise, and I will speak on my own behalf and not on his, Islam was from the very beginning a religion that was associated with mundane achievement. Prophet Muhammad fled from Mecca in 622 and returned as ruler in 630. Within a century, Muslim armies had reached from Andalusia to the borders of India. And beyond military conquest, there was the making of a new civilization that was brilliant a thousand years ago. Had the equivalent of Nobel Prizes been handed out then, they would have gone in disproportionate numbers to the Muslim world. Baghdad, Cairo, Grenada—these were the centers of learning and of political power. Whether one looks at health or wealth or political stability or cultural achievement, the Muslim world was doing very well. From the standpoint of architectural achievement, scientific breakthroughs, and technological applications, the Muslim world was doing very well. For a variety of reasons this surge ended. One can dispute the date in something like the 13th century; the conventional date is the coming of the Mongols in the 1220s. Whatever the cause, whether it be external such as military defeat and economic downturn or an ossification of ideas, the effect was quite clear and it was twofold. First, a tendency to look back rather than look forward. To look back to the good old days, to repeat well-worn formulae, to have a sense that things had reached their culmination and need not go further. And second, a blocking out of what the outside world was doing. One famous exposition of this was by Ibn Khaldun, the great intellectual figure who in 1394 in Tunisia wrote that he heard there are things happening in Europe, but "God only knows what is taking place there." 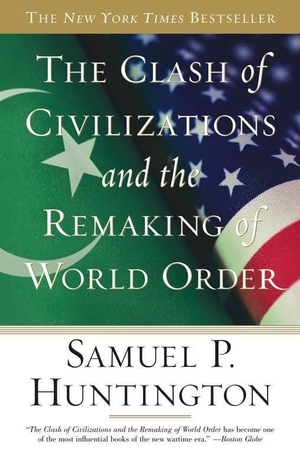 He wrote this at a time when things indeed were taking place, and for the next centuries the Muslim world was largely isolated from the extraordinary developments occurring in Europe. These came crashing down at the end of the 18th century. The conventional symbol of this is Napoleon landing in Egypt out of the blue in 1798, his army easily taking care of the local armies and conquering the country—only being expelled, by the way, by the British. There was no local force that had the power to do that. 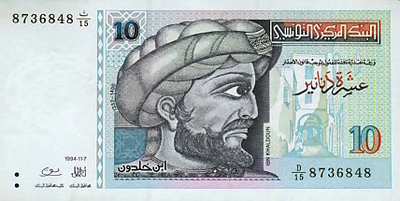 Ibn Khaldun, as imagined on a Tunisian 10-dinar note. From that time forward, two centuries now, there has been an overriding question in the Muslim world: What went wrong? (to use Bernard Lewis' phrase). Why did a civilization which was thriving, which was intellectually, religiously, and economically doing well, then decline? What happened? What went wrong? Basically, the last two centuries can be understood as one protracted attempt to answer that question, to figure out what went wrong and thereby to answer and to find the solution and fix things. To speak very broadly, we can divide the last two centuries into three eras. First was the liberal era from 1800 to 1920, when the major effort in the Muslim world was to emulate and learn from the West. The battle was between those who wanted to emulate the West and those who didn't. The second era, from 1920 to 1980, was the era of looking at the totalitarianisms in the West as a model, the fascist more briefly and the Marxist-Leninist more at length. These were the Western heresies instead of the Western liberal traditions. The third period, from 1970 or so, is the era of the Islamist totalitarian temptation. In other words, it is still totalitarian, just as it was in the second, but now it is no longer European in origin but home grown. So now we are at a moment, and indeed it has been growing for the last quarter century, of Islamist temptation. I submit to you that the answer being given today about militant Islam is about as wrong as was the previous answer of fascism and communism. There is something fundamentally dysfunctional about militant Islam; nonetheless, the attempt is being made, and strenuously. An interesting article just appeared in Commentary magazine, written by Francis Fukuyama, who argues that militant Islam, for all its aggression, horrors, and murders, might actually have a redeeming quality, which is to modernize the societies it rules. I disagree. One could likewise say that Mao modernized China, but that does not change my judgment that his rule was a horrible disaster. The totalitarian route is not the route to modernization but a route to failure. Now let's turn to the issue at hand, which is 9/11 and its aftermath. In the short term, it has a very negative effect precisely because 9/11 was a great success for militant Islam. I believe that the support for this totalitarian movement comes from its successes and its loss of support comes from its failures. 9/11 was an extraordinary achievement. I need not recount for you how the United States was in trauma, with its airspace closed, the national economy taking a significant hit, and so forth. This in the Muslim world was a source of elation, exaltation, a sense of potential. In the weeks that followed 9/11 a year ago, one saw demonstrations, fiery rhetorical statements. There was a demonstration in Mecca which I believe was the first such public demonstration in Meccan history. There were very, very strong statements against the United States, Britain, Israel, and so forth. Since then, the tide has changed. 9/11 is a famous date and 11/9 is not so famous, but the latter is significant as well, marking as it does when the first major Taliban city fell. That had a very dramatic, sobering effect. In Pakistan, for example, the major pro-bin Laden demonstrations ended in November as the air went out of them. There was no longer a sense that success for militant Islam was around the corner. We see a more sober mood since the fall of the Taliban. Nonetheless, while things are not as excited and extreme as they were a year ago, the militant Islamic wave has yet to crest. This is the most extremist moment in the long, 14-century history of Islam. There has never been a time quite like this for extremism. This era's Islam is not the norm but the exception. That has the positive implication that things probably will and certainly can get better. It's worth noting that there are very few voices in opposition to the extremist interpretation. Bin Ladenism, as it's sometimes called - the most harrowingly extreme version of extreme Islam - is being expounded almost without reply. Where are the moderates? They do exist, there are plenty of them. They are voiceless, they are hapless, they are intimidated, they generally don't get very far. The mood is one, if not of Bin Ladenism, then of sympathy for it. That is why this is such a bad moment. That's why the short-term consequences of 9/11 have been so disastrous, in my estimation, in the Muslim world. This is a very, very low moment - a little bit higher than a year ago but still exceedingly low. Long term, however, I think the implications are more positive, because I believe that this large strike against the United States has awakened the United States to the fact that it is engaged in a war. That war actually began in November 1979, with two striking events: the takeover of the U.S. Embassy in Iran and the assault and murder days later of two Americans in the embassy in Islamabad. These marked the initial assault by militant Islam on the United States; they were followed by many subsequent attacks, both abroad and domestically. There was the attack on the U.S. Embassy in April 1983 in Beirut, which killed 17. The Marine barracks explosion followed in October 1983, killing 241. Then came attacks on embassies, on military bases, and on airplanes. More recently, two attacks took place in Saudi Arabia in '95 and '96, attacks in East Africa on American embassies in August '98, the attack on the USS Cole in Aden Harbor in October 2000. Attacks also took place domestically. 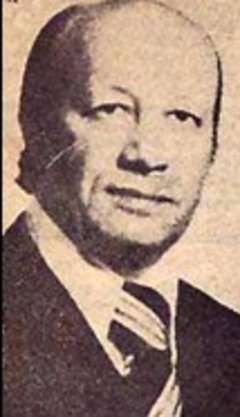 The first one was in 1980, when an African-American convert in support of the Iranian regime murdered Ali Akbar Tabataba'i, an Iranian dissident in the Maryland outskirts of Washington. There was the killing of the Danish tourist on the Empire State Building, the first World Trade Center attack in 1993, an attack on a Jewish boy on the Brooklyn Bridge, an attack outside the CIA headquarters, an attack on a Muslim leader in Tucson, Arizona, an attack on three Indians in Washington State, and so on. In all, I count - and I do include the Egypt Air downing of late 1999 - more than 800 dead before 9/11; not all Americans but 800 dead in the course of the campaign of attacks on Americans. These were well-known incidents, they got a lot of attention, but the U.S. government didn't do anything to undermine the enemy force and it did nothing to change policy in respect to security, immigration, or other matters. Most basically, these attacks were treated as criminal episodes, not as part of a war effort. For example, the 1998 bombings of the two embassies led to the United States capturing four of the perpetrators, bringing them to New York, giving them lawyers, putting them on trial, and convicting them. There was no effort to go beyond these foot soldiers to a hierarchy that had sent them. The great change a year ago was the immediate understanding, finally after 22 years, that the attacks on Americans are not just a matter of criminality but represent a war effort. The response was to declare a "war on terror." In other words, while war against the United States has been waged for 22 years, Washington only woke up to this fact a year ago. The good news is that we did wake up to it. It is good news for the Muslim world as well, because I believe that the ultimate purpose of this war - and here I'm going to give you an insight that the U.S. government itself doesn't realize - is to transform Islam. You night tell me that you haven't heard President Bush say this, and I grant you the point. The president and all the administration leaders talk only about terrorism, as though terrorism were an enemy in itself. This cautious formulation has its uses, but it is not accurate. The war is not against terrorism any more than World War II after Pearl Harbor was against surprise attacks. The war is against those who perpetrated the attacks since 1979, and that is Islamists; it is also against their mobilizing ideology, militant Islam. The war is not against Islam the religion, not against terror, the military instrument; it is against militant Islam, a terrorist interpretation of Islam. Militant Islam is an ideology based on Islam but transformed into something different. The issue is not faith for there are many Muslims who hate, loathe, fear militant Islam. There are hundreds of thousands of Muslim victims - indeed, 100,000 in Algeria alone. This is ultimately a battle between Muslims over the nature of Islam. Will it be the extremist reading that prevails today, or will it be a moderate reading? We who are not Muslim, and the United States in particular, have a role in supporting one side against the other, but they will decide it. Huntington to the contrary, it's not a clash of civilizations. It is not a clash of civilizations; it is a fight among Muslims over the nature of Islam. In this light, the U.S. war must ultimately help moderate Muslims against the radical forces. Ultimately, I am convinced, Americans will come to understand and acknowledge that the war is against a totalitarian ideology. If this rings familiar, it should. Just as the ultimate U.S. goal in World War II was to destroy the fascist ideology that stood behind the Germans, Italians, Japanese, and other states and movements, and just as in the Cold War our ultimate goal was to destroy the Marxist-Leninist ideology that stood behind the Soviet Union, China, Cuba, Vietnam, and other states and movements, so today the goal must be to destroy this militant Islamic movement and the ideology that stands behind it. "Destroy" does not necessarily mean to kill, because there are different ways to accomplish its end. World War II involved military destruction, but the Cold War ended with almost no violence. Thus, destruction need not be military destruction; it means convincing the enemy population that it is pursuing a dead-end set of goals that will lead it to disaster. Ironically, some Muslim leaders are ahead of the West in understanding this problem. The key question facing Americans is whether this realization will happen later or sooner? How long will Washington continue with this formulation of "terrorism" and not confront the real enemy? The longer it refuses to confront the real enemy, I predict, the greater the chances that the enemy will inflict more damage. I worry that the events of a year ago were merely a prelude for much larger and worse disasters. You cannot win a war unless you name your enemy. Just as a doctor must identify and name a disease to treat it, so a strategist must identify and name an enemy to defeat it. We must name the enemy, isolate the enemy, fight the enemy, defeat the enemy - not necessarily militarily, but defeat the enemy. When we do that, then moderate Islam, which today is weak, will have a chance to prosper and to succeed.